Dan appeared on Good Morning America, Wednesday April 16th to discuss the latest on the Oscar Pistorius trial. The defense brought in a forensic expert to back up Pistorius’ account of what happened the night he killed his girlfriend, Reeva Steenkamp. The forensic expert, Roger Dixon, contradicted the state saying their investigators were wrong and explained that Steenkamp was not facing the door as they had said earlier in the trial. 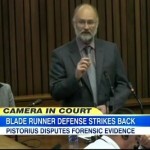 Additionally, the defense tried to show that the sound of the cricket bat and the gunshots were extremely similar but lead prosecutor, Gerrie Nel, attempted to discredit Dixon saying he is a forensic geologist not a sound expert. Says Dan, “The defense may have been trying to do too much with this guy. This guy became an all-purpose expert and you heard the prosecutor then focusing on the specifics and saying wait a second, how are you an expert on this or that? One of the crucial points you heard Lama referring to, was where was Reeva Steenkamp standing inside that toilet cubicle? If she was facing the door, that would suggest there was an argument going on, which is what the prosecutor say. The defense is trying to suggest, no, no, she was probably bending over, maybe listening, but not facing the door. And without a credible expert on their side, that’s a real problem for them…” Watch the full clip here.